A cataract is the clouding of the intraocular lens, which is located behind the pupil. Its function is to focus the rays of light clearly onto the retina. For various reasons, most commonly old age, the lens can become cloudy and opaque. The location and loss of transparency produced in the lens by the cataract will affect vision. 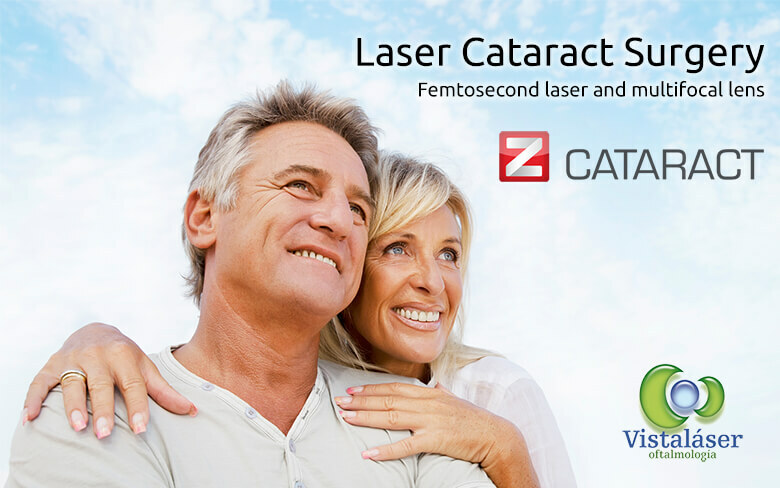 Femtosecond laser surgery for cataracts is an innovation providing increased safety and quality of vision. The ‘manual’ steps in surgery, which mean that the outcome depends on the human factor, are replaced by a preprogrammed femtosecond laser. MAXIMUM SAFETY: The laser replaces the parts of surgery which depend on human ability and the skill of the surgeon. IMPROVED VISION: The accuracy of the treatment, together with the correction of small residual astigmatisms, maximises both long and short sightedness. NO SCALPEL: The necessary incisions in surgery are made by the laser with absolute precision in size, location and shape. SHORT RECOVERY TIME: The energy applied to the eye is reduced in such a way that it shortens the time it takes to get back to everyday life. PERSONALISATION: The surgeon plans and programmes the laser using micrometric precision, programming the surgical parameters of the unique characteristics of the patient’s eye. The lens is emulsified using ultrasound and absorbed through a small cannula. Then, an intraocular lens is inserted through a 2.75 mm incision which corrects the acuity of the eye without a lens. The operation is carried out in day surgery and does not require hospitalisation. It lasts approximately 20 minutes and is carried out using locally applied anaesthetic drops. The patient is awake but relaxed since a sedative is administered. Once the surgical intervention is completed, the patient can walk out and has a very quick visual recovery time. Generally, in both public healthcare and most private clinics, the intraocular lens implanted after extracting the intraocular lens is monofocal. This only corrects distance vision, therefore glasses are needed to see at near or intermediate distances. At Vistaláser we are specialists in implanting multi-focal, intraocular lenses which replace the natural lens and allow the eye to focus from a distance and up close, facilitating vision at all distances. The lenses are designed so that unlike using glasses with progressive lenses, it isn’t necessary to look down to see up close and up to see at a distance. With progressive multifocal lenses you can see near, far or mid-distance from any positioning (up, down or face-on). The brain, naturally and without need for adaptation or learning, selects the image of the desired object at that moment. It is a stable and definitive solution since by extracting the eye’s lens, the transparency of the optic system is regained and there are no more changes to the visual acuity of the eye. Each patient has different needs and lifestyles. Usually treatment consists in taking advantage of cataract surgery to restore vision at all distances without the need for glasses. In other cases, the patient’s lifestyle means that intermediate vision is prioritised, as may be the case with people who often use computers. Sometimes the individual anatomy of the eye (large pupil etc) means a particular type of lens is recommended. Finally, having a prestigious ophthalmologist surgeon can provide a reassuring solution for cataract surgery on eyes with other associated pathologies or on patients with other types of general illnesses. How do we personalise treatment? With the security of the experience of thousands of completed cataract interventions. With a Femtosecond laser, the latest in cataract surgery; this allows the personalised programming of surgical parameters for better precision, safety and quality of vision. With a team of friendly, attentive and prestigious ophthalmologists who listen to the patient. Implanting a quality, multifocal lens, allowing you to see at a distance and up close. We work with the best lens manufacturers in the world and with every type of lens available. We consider the materials used, the geometry, the size and the optical design. We implant trifocal, bifocal, monofocal, spherical and toric lenses. Our huge range means we can choose the best lens for each eye and for the needs of each patent. Calculating the visual acuity of the lens with a biometric interferometer. The most precise means in existence. Using toric lenses which correct astigmatism where necessary. 5. What is the day of the operation Like? Finally the day to stop depending on glasses is here. An analysis has been carried out and the best treatment has been chosen for your individual needs. Thanks for trusting in Vistaláser and our doctors. In general, we recommend Cataract Surgery for patients who begin to feel some difficulties in their daily lives. This type of lenses can reduce dependence on glasses after Cataract Surgery. These lenses will allow you to focus on far and near. We can also offer trifocals, further focus perfectly intermediate distances. Can I have surgery on both eyes at the same time? In Vistalaser we do not usually operate both eyes at the same intervention, mainly to reduce the risks of surgery. Do you feel pain during or after the operation? In this type of intervention we use topical anesthesia using a few drops directly into the eye. During the procedure you may feel some pressure in the eye, and after the operation some discomfort but nothing serious or painful. When I can get back to normal life? After Cataract surgery the patient should rest 24 hours, the next day you will start to enjoy your new vision. Should I take precautions after the operation? The specialist will give some simple instructions, and prescribe the use of eye drops to keep a good eye lubrication and prevent infection. Cataract surgery patients whose implants are monofocal lenses do need to wear glasses after surgery, whereas patients whose implants are multifocal lenses can greatly reduce their dependence and even forget the glasses. The cost of Cataract Surgery depends on the type of lens we are going to implant and the technique we are going to use. These are our prices for implanting multifocal and monofocal intraocular lenses. The price financed is without interest and does not include the opening rate. If you need special lenses for correcting astigmatism you should consult price with the clinic.